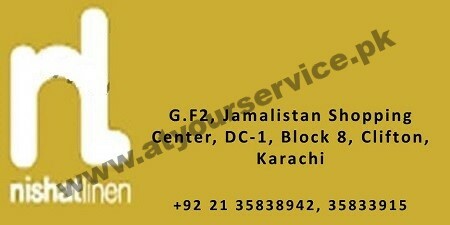 Nishat Linen Clothing is located in Jamalistan Shopping Arcade, Schon Circle, Clifton, Karachi. It is a vertically integrated textiles companies in Pakistan. The company’s production facilities include spinning, weaving, processing and power generation. It deals in stitched and un-stitched clothing line.